In this article, we at Pokies.com will be looking at the exciting history of slot machines and today’s online pokies. Pokies go by many different names, the Americans have coined the term one-armed bandit, whereas the British refer to the casino game as a fruit machine. Of course, the Aussies adopted the term pokies when referring to slots; reason being is that they abbreviated the term ‘Poker machine’. Slot machines are very simple to use. It is operated by merely dropping a coin into the slot, and pushing a button or pulling the lever. By doing this, a player would activate one or all of the reels available on the machine. Thereafter, if you hit a winning combination, the machine would award you by dropping either a few coins that it had in it or all of its coins into the trough beneath it. Historically, these machines generally only displayed symbols like fruits, stars, card suits, bars the words jackpot or bar, as well as number – to which seven is always a favourite. The name “slot machine” is actually an abbreviated version of nickel-in-the-slot machine. Originally, snack vending machines shared the name slot machine. However, as the 20th century came along, the term slot machine was used exclusively for gambling devices. The very first coin-operated slot machine was traced back to the 1880’s in America. Initially, these machines were not looked at as gambling devices, but rather novelty machines. These machines were a lot like the toy horses that raced their way across the bar, whereby players would bet on the outcome. Often, these machines would attract the attention of patrons when placed in saloons or similar establishments. It all started off with the winning patron being paid in free drinks or cigars or even trade checks that were in essence, credits for refreshments. Eight years later in 1888, the machines had coins in existence. With the first slots machines, players would insert coins which would land on an internal balance scale. In turn, the scale had a possibility of tipping the scales and spilling out the other coins. Later on, devices with a more circular display and a spinning indicator that would eventually stop at a particular number or symbol. So, let’s jump forward a few years. To 1894 to be precise, this is where inventor Charles August Fey comes in. At the time, Fey was a mechanic in San Francisco. 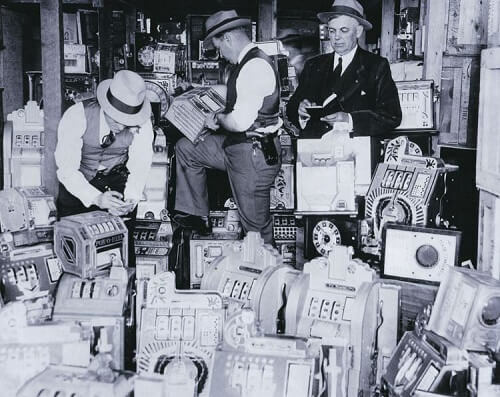 He managed to build the first-coin operated slot machine, similar to the ones that we are familiar with today. In 1895 Fey managed to build the 4-11-44 in the basement of his house. His invention was so successful at the local saloon that Fey was able to quit his job and open a factory where he went on to produce more machines. It was in 1898 that Fey built the Card Bell. This machine was the first three-reel pokie of its kind which allowed for automatic cash payouts. The Card Bell had a lever that would be pulled to set the reels into motion. To form a winning combination, the reels would need to land in a way that the suits of the cards would form a poker hand. Fey then went on to his next invention, the Liberty Bell which was created in 1899. This machine made use of horseshoe symbols, bells and card suits on the reels. For a player to achieve the maximum payout available, the three bell symbols would need to line up. Unfortunately, due to the catastrophic 1906 earthquake, only four of over 100 Liberty Bell machines that were built by Fey managed to pull through. The slot machine proved to be immensely popular among the patrons in the San Francisco. Due to the immense popularity of the machine, copies of the machines were quickly made by competitors of Fey, namely, Chicago’s Mills Novelty Company. Pokies machines were banned in 1909 from being played in San Francisco. At this stage, there were around 3,300 machines within the city. So, to duck under the watchful eyes of the law, Fey alongside his competitors built a machine that had no slots. In this case, the payout, which took the form of drinks and cigars, occurred over the saloon counters. Soon after these law changes, many of the slots manufacturing factories relocated mostly to Chicago. To steer clear of the laws iron fist, the Industry Novelty Company would call its machines chewing gum dispensers. To further throw off lawmakers, the symbols on the reels were swapped out from card suits to fruit symbols, in a bid to “show various gum flavours”. Later, in the following year, the Mills Novelty Company copied the idea and further added a chewing gum pack symbol (this is more popularly known as today’s bar symbol). More so, in 1916 the Mills Novelty Company came up with the ‘jackpot’. Which as we all know; specific combinations cause the slots to spit out coins. Jumping forward significantly, slots became quite prominent the world over, once World War II came to an end. In this case, the government used these machines to draw in revenue. Even the French ended their 50-year ban on the pokies in 1988 to assist with their tax revenue. New payout schemes were rolled out in the 1950’s whereby 3 and 5-coin multipliers, the payouts are proportional to the number of coins that were inserted before the lever is pulled. Video Slots: the machines that have a monitor displaying reels. These were brought to Vegas in 1975. In the formative years of the 21st century, casino operators were worried that the popularity of playing slots at a land-based casino may fade. This was due to the introduction of computerised slots. Nowadays, we see a lot of competition between online casino sites that try to draw internet gamblers in with their incredible array of pokies online. However, for the very best choices in online casino sites, check our Pokies.com top casino sites.